For Dave Clawson’s rebuild of the Wake Forest football program, it would be difficult to pick out a more pivotal game than this weekend’s matchup with Florida State. Sure, many predicted that the Deacons could be 4-0 heading into this matchup. But few would have given them any chance against the Seminoles, who entered the season ranked third in the country. This game — with a road trip to Clemson following — appeared to be the start of a stretch where the Deacons seemed likely to lose five in a row. But here as week five approaches, not only is Wake Forest undefeated, but Florida State is winless. The game suddenly looks like one the Deacons could steal. Let’s look at some of the reasons this is such a big game for Wake Forest. A fifth victory at this point in the season would certainly make the drive for a bowl-eligible six wins much easier. As mentioned, a very tough stretch follows; a loss this week could turn into five in a row with trips to Clemson and Georgia Tech, a home game against Louisville and a trip to Notre Dame following. That would put pressure on winning at least two of the last three: at Syracuse, then N.C. State and Duke at home. But a win over FSU would mean the Deacons would just need one more the rest of the season. Last year, the Deacons also were 4-0, but then they lost to N.C. State on the road as a part of losing three of their next four. A home win over Virginia on Nov. 5 was the only victory down the stretch, but it was enough to get the Deacons to a bowl game. Dave Clawson posted a winning record and a bowl victory last season, the first of either for the program since 2008. But Clawson is still missing at least one thing: conference clout. The Deacons have won five ACC games during Clawson’s three seasons, but a closer look reveals that those have been against the bottom of the league’s barrel. Clawson beat Virginia Tech in 2014, Boston College in 2015 and then Duke, Syracuse and Virginia last season. Those teams went a combined 7-33 in the league over those seasons, with no team winning more than three games (Virginia Tech). To truly change Wake Forest’s profile, Clawson needs to scatter in some wins against upper-tier ACC programs. This is a massive recruiting weekend for Wake Forest, with Rivals listing more than 35 prospects who will be visiting (including some commitments). The weather will be perfect, and it will be interesting to see the size of the crowd. A packed house and a victory would go a long way to putting a successful image of the program in recruit’s eyes. That list includes five players in the 2019 class who are ranked in the top 50 at their position in 24/7 Sports’ consensus rankings: Khalid Martin (24) and Jeremiah Gray (31) at safety, Devin Ellison (40) and Michel Duke (49) at running back and Christian Rorie (34) at strong-side defensive end. As a reminder, these games are not foreign to Wake Forest in recent history, despite the overall struggles of the football program through the years. The Deacons were 3-1 with the only blemish being an overtime loss at Syracuse in the opener. Wake Forest hosted No. 23 Florida State in front of 33,115 at BB&T Field (capacity is 31,500). Wake Forest won 35-30 behind three touchdown passes from Tanner Price and 136 yards rushing from Josh Harris. Chris Givens had six catches for 101 yards. Interestingly, the Seminoles were having a quarterback issue, as they are this season. Clint Trickett started as E.J. Manuel was being held out with an injury. Jimbo Fisher said he was told that one good hit could keep Manuel out for six more weeks. Trickett turned the ball over three times in the first half, and Fisher turned to Manuel, who threw two interceptions. The Deacons lost their next game, a home game against No. 19 Virginia Tech, and went 2-6 the rest of the way. They lost by a touchdown to Notre Dame, then by three at No. 10 Clemson. They fell 23-17 to Mississippi State in the Music City Bowl. The Deacons were again 3-1, and this time it was Clemson coming to BB&T Field. The Tigers had started the season ranked No. 9, but were now 3-2 and out of the poll. Wake Forest won 12-7 in front of 33,988 fans, with Riley Skinner’s touchdown pass to D.J. Boldin with 5:28 left providing the go-ahead points. Clemson coach Tommy Bowden resigned four days later. The Deacons immediately lost their next two games, finishing the regular season with seven wins before beating Navy in the EagleBank Bowl. Wake Forest was 5-0 in Grobe’s breakthrough season, with No. 15 Clemson coming to Winston-Salem. The stadium was overflowing with 35,920 fans, and the Deacons were dominant … almost. Wake Forest led 17-3 after three quarters and were lined up for a field goal early in the fourth. But a mishandled snap led to a fumble that lineman Gaines Adams returned 65 yards for a touchdown. The Tigers would maul the Deacons from there, winning 27-17. 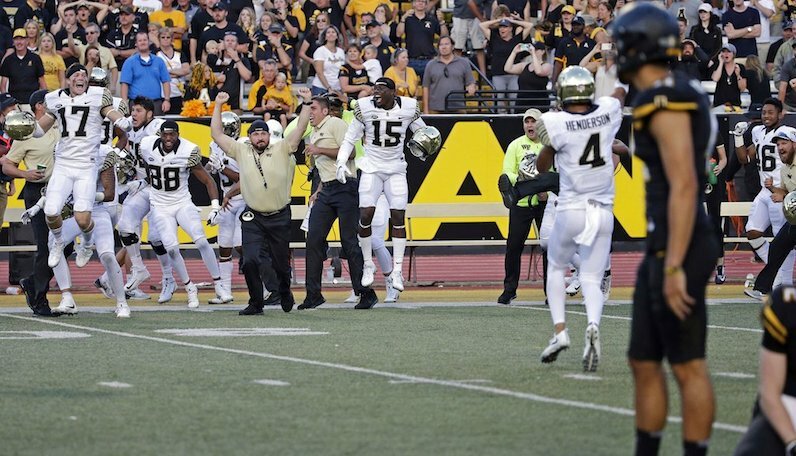 However, it was merely a bump in the road for that Wake Forest team, who won six of its next seven, including the ACC title game against Georgia Tech. The Deacons fell to No. 5 Louisville in the Orange Bowl.